Based on the number of signups the format was changed. See posts from here on for actual infos and rules/scoring. No signup required. Players will be assigned randomly to teams each game. Watch out for the colors to identify your team partner in each game. For transparancy I kept the original posts as they were. I hope it is not too confusing. If we should find a time outside of Luxtoberfest to play some clan games based on the original rules and the founded clans I would still be happy to host it. But the tournament format was changed as we did not find time shedules to match every clan. several clans will play 2 vs 2 vs 2 and 3 vs 3 games on different castle-based maps for the royale castle crown. We will build up at least 3 clans (based on number of applications maybe more). Signup is required to play! You can sign up till 06th of October here in the forums or by pm to me. Later applications are still possible but they might not be accepted then. With your application you agree to the rules and you agree to be present for the games. Each player has to play a certain minumum of games to be rewarded. Please send us also a suggestion for a cool clan-name with your sign-up. The best suggestions for the clan-names will be choosen by the mods and you will be added to your „own“ clan. All other applications will be picked by the clans or added by the mods to create mostly balanced teams. Please only sign up, if you really have time to play (!) It is a team game. Becomming afk during the tournament punishes your team! Quitting the tournament is not sportsmen-like. If you will have only limited time, but want to play nevertheless, then let us know already with the application. depending on the numbers of signups we might cancel some of these days and do a smaller tourney instead. These are the possible Dates. in order to keep the time under Control we could Play with a time Limit and in case of a Marathon we could devide remaining points under the players alive (runded down). 1)	Each team needs to have at least 2 or 3 players present for all games. We play 2 vs 2 vs 2 and 3 vs 3 games. If one player is missing at the start of the game, the game will be played 2 vs 2 vs 1 or even 2 vs 1 vs 1 (at 3 vs 3 games we play 3 vs 2 or even 3 vs 1 in case). There will be no bots. There will be points for each place, so it should be in your own interest to have all players present (else you can get points only for the present players!). Only if a player becomes afk during a game, (s)he will be replaced by a bot..
2)	Each clan has to nominate a captain and a deputy, who can take decisions for the clan and interact with the tournament host. - it is strictly forbidden to give players from other teams any strategic advices. Discussing your own team strategy in a private chat room is allowed and is highly recommended. You have to Setup private Chat rooms on your own. - do not comment moves from other players you did not like (don't blame others in chat). 4) Newbies are explicitly welcomed. Help them to learn the game. Newbies are expected to listen to experienced players. 5) Guest out when you enter the tournament host. The mods keep the right, to do any decisions and changes depending on the number of signups. The basic aim should be to end on the first places, but there might be situations where it is better to kill your teampartner in order to take his cards in order to win the game (1st + 3rd is still better than 2nd+3rd). So we will hopefully have interesting tactical games. It is a TEAM game. So moves that would usually be „targeting“ of a player can be a legit part of the tactics here. Playing for places can take place. Don’t get frustrated. Be a teamplayer and try to play not selfish! There will be no individual Rankings, only Team results are what counts!. Now it is still time to bring up suggestions and ideas … but there will be no changes after the tourney has started (unless all team captains or deputies agree). I have no real experience hosting team games. But I want to do this as I think that team games are great fun and too rare here in Lux. I do not have a Version to host automated team games. We will have to do a lot by hand. Not everything will be perfect. Please help to make this a fun event. This IS NOT the Castle tournament Snyper established. It is based on his ideas, but it is NOT the original Castle Tournament and shall not replace it! We will listen to suggestions, but it is usually not possible to fullfill all wishes. We need to keep the things simple. The time for preparation ist short and we do not have the time that would usually be needed, but we will give out best to make an fun event. I hope we all will have some great fun! Last edited by GFips on Thu Oct 19, 2017 3:18 am, edited 3 times in total. A forum account is highly recommended but not required. I'm kinda pressed for time these days, but sign me up. This could be fun. Thanks for all the signups so far. I have sent a pm to all players who have signed up yet. Please give me feedback asap so that we can find a suitable final shedule for everybody. We probably will cancel some of the dates. Signup is still possible. If you cannot do all the dates then just let us know with your signup and we will see if we find a way! So are there games today (Oct 10)? Please let me know. There will be no games for today. Because of the small number of players we are doing a reduced shedule where all players have time. I will publish a shedule soon. I am just still waiting for some feedback from players. Thanks to everybody who has signed up. [/color]Signups are still welcomed! You can still join a clan with the agreement of the captain. If anyone wants to change the team with someelse, then let me know till the first game! if anybody sees any troubles with one date please let me know soon so that we can find an alternate date if necessary. We will play 2vs2vs2 and in case there are at least 3 players of each clan online there will be also 3 vs 3 games (each clan vs each clan). Tournament host will open 15 mins before start. Please be present accurate. We will wait 5 mins in case of missing players. On the first day, we will discuss and finalize rules together before the games, so that games will start approximately 15 mins later. We will Play each 2 hours (maximum 3 hours). In order to avoid targeting of leaders I would prefer to Play 3 vs 3 games only on the last day(s). In case of questions feel free to contact me also by pm. I hope it will be a fun event for everybody. Please contribute ideas for improvements if you have one. As we do not have too many players, we can only do this if you are all present for the games. I keep the right to cancel the tournament or host just a single day if we do not manage to have enough players present. Unfortunatly I do not have a version for hosting team games. So I will host manually and I will also do the rankings manually (back to the roots). After each day i will sumup the results and the scoring here in the forums. I aplogize in advance if not everything will be perfect. Last edited by GFips on Fri Oct 13, 2017 2:03 am, edited 3 times in total. I would like our team to be called Earth anyway Why not? This tournament shall not replace the original Castle tournament. As there are only 3 clans, I do not want to pick the traditional castle team names. The original castles tournament was (and maybe still will be) one of the major events in Lux for many years. I will be proud part of the clan, but I am not the captain. I prefer to stay in the background myself. Woohoo! Not a single game played, and we're already in the lead! VIVA LUXTALIA! I am sorry that I didn't get this until tonight. My team's name will be "Skill Nameless"!! If there is a replacement for GK, send him/her my way. I will be ready on Saturday 10/15. Sorry. But I kinda had to. Wow! Didn't knew Viva Luxtalia are such great singers. King (size) in the middle, TSK and Rich Girl surrounding him,but wait, who are the othe two Girls? Did i miss any signup? Games will begin today! Signups are still welcomed! Hi all I'm really sorry I won't be able to show up tonight for the tournament I'll surely join you the 15th!! OK - lets do a sumup of happenings. Unfortunately we did not get enough players present to the games. I am very sorry, but so it makes no sense to go on with the original plan. I want to thank everybody who was there and i am sorry, that there were not more players present. I apologize that it was not what it was intended to be. We will change the format. We will make random teams and play some games if there are enough players (4 humans needed). Winner picks next map out of the castle maps. You will be randomly assigned to a team. No signup required. Watch out for the colors to identify your team-mate. Teams will get same points for all players. Scoring remains as originally planned. Rankings will be on individual players. Rankings will be done manually and be published 1 or 2 days after the games. Only 2vs2 and 2vs2vs2 games count. Wins on 4-human games will be weighted lower than wins on 6 human games. More detailed explanations on the scoring will follow with the 1st ranking. Last edited by GFips on Thu Oct 19, 2017 6:57 am, edited 3 times in total. To expound on what Gfips says here, we have (he has, with my suggestion) decided that the best way to go is to allow anyone to play when they enter the room. People will get randomly paired in 2v2 or 2v2v2 games with someone else who is present. You can tell your partner by the similar color he/she has to yours at re-start. Gfips will record everyone's record individually, i.e., if I partner with Smashley, both she and I will receive a Win or a 2nd place or a 3rd place for our game together. If randomly I am next partnered with Manimal, he and I get a win/2nd/3rd for that game and Smashley (now partnered with Darth Rellek) gets her own score with him. At the end of the month, we'll figure out some way in which the highest scoring individuals will team with one another to determine a champion. If two players specifically want to play together, and can get this information to Gfips before the start of the game, I don't see why he can't make that happen. The advantage to this is that we don't have to wait for players on specific teams before we start games, and people will have the fun of a bunch of different partners for the first time. People playing in this tournament all seem to be veterans enough to adapt to one another's playing strategies on the fly, making for effective team play. Excited for the rest of the tournament (though I may not be here on Sunday at its currently scheduled time). Scoring will remain as above, but each player of the random generated team gets half Points of the team sum, e.g. you get 1st (7 pts) and 2nd (5 pts), so you will get (7+5)/2 = 6 pts each. If your team gets 2nd and 5th you will get (5+2)/2 = 3.5 pts each. The ranking will be based on the tally points/games played. There will be minimum number of at games you have to play to get an award. Please finish games even if you finish 1st+2nd, so that the game is locked [the "winner" picks the next map. 2nd can choose the settings. After 3 times in a row map has to be changed). Thank you millty for your efforts. 4-human (2vs2) and 6-human (2vs2vs2) games will count. But 4-human games are weighted only as half games as it is much easier to win there. So if you get 6 points in a FH game and 3,5 Points a 4-human game your tally will be (6+3,5*0,5)/1,5 = 5,167. So you get full points for 4-human games, but they will count as half games only. Based on the highest tally the ranking is determined. In order to get rewarded you will Need a minum number of at least 7 games played (4-human games count only as half game). If there are not at least 6 people doing this cut, it might get lowered. Next games start today a 8pm Berlin. You can still join the tourney! No signup required. See you there. We had some great games going on (18 games played on 3 days so so far) - thanks everybody for playing. 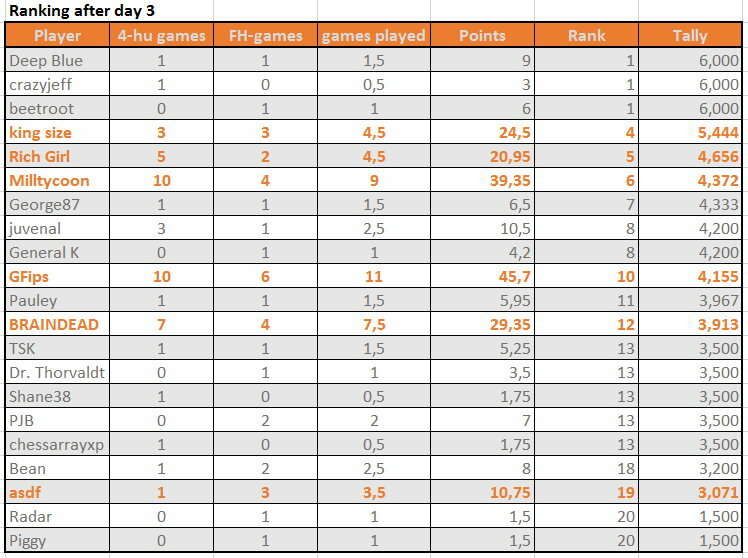 (bold marked players have at played 3,5 or more games (remember: 4-human games count as half games only) and have so at least half of required 7 games played). The number of minimum played games might be lowered if not too many people pass the cut. Based on interest of the players i might add an additional day. Last edited by GFips on Thu Oct 19, 2017 3:20 am, edited 1 time in total.